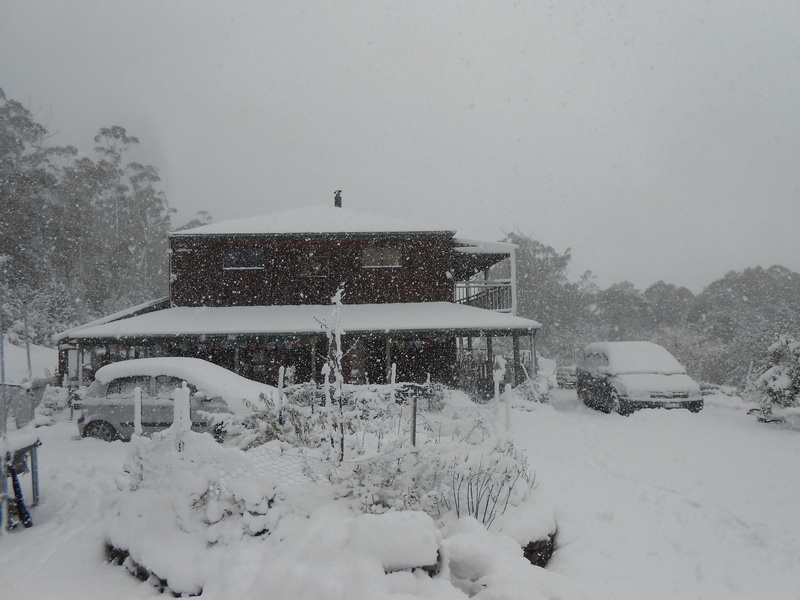 A view of the house so you can see the depth of the snow. This morning I was greeted by the sight of a white world. Several inches of snow had fallen overnight and throughout the morning, turning my property into a frosted wonderland… at least, that was the impression my children shared. Kitty and I, on the other hand, were less excited. Kitty had planned on driving to the city to buy some fabric to make some dresses for our girls. 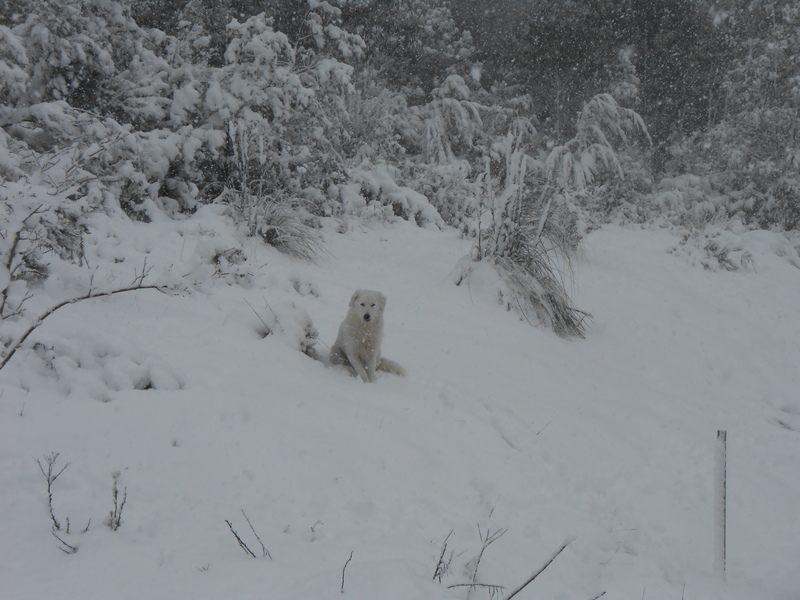 With the thick snow she decided it was safer to stay at home. I had plans to install the dog fence this weekend, yet with the snowy conditions I decided it was better to focus on indoor activities. My first task, after breakfast, was to check the animals. While it was cold, all my animals were under cover and protected. Next I had to check my gate. When it snows people from down the mountain have a tendency to come to play. I don’t have an issue with this and I can understand why they come up the mountain. I do have an issue with people coming up my drive way, to my house and making snow men on my front lawn. So, I walked down the driveway to ensure that my gate was closed. This did remind me of one of our plans for the future. We currently have four chestnut trees growing. One of my plans is that once they produce enough chestnuts we could roast some and sell them. I suspect that due the amount of traffic I saw on the roads this morning, we could sell some down the drive way. In addition to the issue of lack of fire wood, we are also a little low on bread. Kitty would have been getting a few loaves today, yet with the snow were have to rely on ourselves. 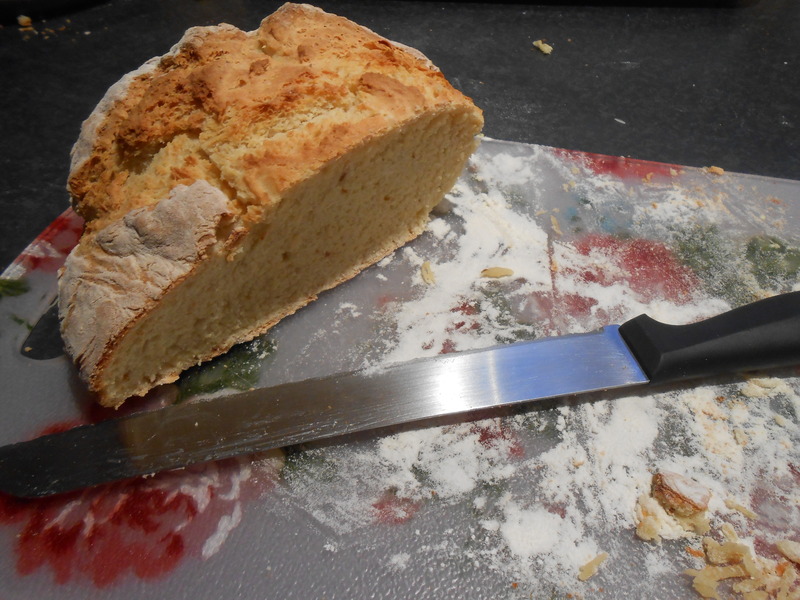 This gave us the opportunity to make a loaf of Irish Soda Bread. Let me tell you, this went down a treat at lunch time, with only a little left for later.